SPECIAL NOTE: Most Viewliner I Sleepers no longer display their names. The names listed here were original names given to these cars previously. The Viewliner I Diner originally never had a name but was given the name "Indianapolis" when it was rebuilt in 2011. Amfleet II Cafe/Lounge/Diner-Lite cars also no longer display names. After getting a quick photo of the train, I boarded Amfleet II Coach #25010, which was the 3rd of 4 coaches in the New York section of the train. I was told by the coach attendant to just find an open seat as he was assigning seats but by the time I boarded, the coach was nearly full anyway. I took aisle seat #46 though I would sit there for a matter of a few minutes as the train made a double spot to account for baggage headed for New York, then would depart Buffalo-Depew Station at 9:22am, running 14 minutes late. No big deal, especially for this train! Shortly after departure, I walked straight to the Viewliner Dining Car which is the only car of its kind in existence today so as to have breakfast. The car was built in 1988 as an experimental car that would be the next generation of single level dining cars and served for several years until eventually being stored around 10 years ago. In 2011, the car was pulled out of storage and completely gutted down to a shell and rebuilt with all new interior everything and it was fitted with the same trucks that are on the regular production Viewliner I Sleeping cars. All of this was done with Stimulus money and the car has been on a mostly permanent assignment on the Lake Shore Limited ever since. The car is being used as a test bed for new Viewliner II cars that are being built now for Amtrak by CAF in Elmira, NY and in that order of cars is 25 dining cars that will be built based off the Viewliner concept and will replace the Heritage Diners once they enter service. I walked back to the dining car and was seated towards the middle of the car with a passenger who was an instructor from Berkeley, CA who was on his way to New York City to visit family. We had some very interesting conversations about wine as he told me he taught courses about wine back home. I told him this area of New York (Western and Central) is by far, the Napa Valley of the east! If you are a wine connoisseur who has enjoyed wines from this area, I'm sure you'll agree, the wines from this part of New York easily will compete with anything coming out of California! I personally am not a huge wine drinker but I do like a good Riesling or Rose wine. Breakfast would consist of Railroad French Toast, pork sausage patties, orange juice and a Diet Pepsi. The total cost for breakfast was $14.25 and the food was excellent. Amtrak redid all of its dining car menus in November and now the Lake Shore Limited no longer serves pancakes (as I was so excited to see when I rode this train back in October), rather now they serve French Toast which is still quite good. I also noticed the menus feature calorie counts for all entrees. I try not to look at calorie counts whenever I eat out, as generally, I'm not trying to eat healthy if I'm eating out unless I'm at a restaurant like Subway! After breakfast, I headed back to the cafe car briefly and we made our next stop in Rochester, NY at 10:15am. I stepped off the train to take a few pictures while passengers were loaded and I reboarded the train shortly before departing. The train made a double spot before finally departing Rochester at 10:26am, running 18 minutes late, no big deal if you ask me! I spent more time in the cafe car chatting with the crew and eventually went back to the Viewliner Diner to go photograph it now that it was closed and not serving. I then went back to the cafe car and had a Diet Pepsi during what was so far, an uneventful ride outside of a few speed restrictions here and there but nothing significant. Our next stop would be Syracuse, NY where we arrived at 11:45am. Passengers got off to smoke and I darted up the platform to the head-end to get what else? More Pictures!!!! We made another double spot in Syracuse likely to handle more checked baggage and New York sleeping car passengers as Syracuse has a relatively short platform. At 11:58am, running 20 minutes late, we departed Syracuse. Lunch service in the dining car was scheduled to start at around noon, so shortly after departing Syracuse, off I went back to the diner! I was told to sit anywhere I wanted when I got to the car for lunch as there were only 3 other passengers in the car when I got there. I had the Angus Steak Burger with bacon along with kettle chips and a Diet Pepsi for $14.00. The burger was actually very tasty and was served on a toasted bun. A passenger from Santa Fe, NM who was on his way to New York (where he had a second home) would eventually join me and we discussed a lot about Amtrak. I gave him my card for this web site while we talked. After lunch, we arrived at our next stop of Utica, NY at 12:58pm. I once again had to try to get another picture so I ran up to the head-end and got a few before making it back to the train to depart at 1:03pm now running 21 minutes late. We had been following CSX train Q-004 most of the way across the state but eventually, CSX decided to let us pass him though we had to stop first and let westbound CSX train Q-091 pass by us. This of course did cause us to lose a bit more time but in all honesty, this wasn't a big deal since the train was doing relatively well considering how far it has traveled. I chatted a bit more with the crew before eventually going back to my seat and getting my stuff together since the next stop, and my stop in Schenectady, NY was coming up. At 2:36pm, running 36 minutes late, Train #48 arrived in Schenectady. After taking a few more pictures, I called Enterprise Rent-A-Car to come pick me up as I would have a rental car waiting for me on this trip. I waited for Enterprise who eventually showed up in a Chrysler Town & Country minivan. My first thought was I so hope they don't try to put me in one of these boats again like they did in La Plata back in October!!! Once I got back to their facility, I was given the choice of a Ford Focus, a Chevy Cruze, and a Nissan Altima. Take a wild guess as to which car I picked, considering my personal vehicle is a Honda Accord! Yep, you guessed correctly (if you picked the Nissan)! I got a white 2012 Nissan Altima that for whatever reason had a Pennsylvania license plate on it! After filling out the paperwork, I programmed my Garmin Nuvii 50LM GPS to get me to the Courtyard By Marriott hotel on Washington Ave in Albany which is right across the street from the University of Albany! I checked into the hotel very quickly and put my bags in the room then immediately drove down to Castleton-On-Hudson, NY. Unfortunately today, our country experienced a tragedy today in Newtown, CT as this was also the day of the fatal shootings at the Sandy Hook Elementary School. I kept the radio on while making the drive to Castleton to hear more info about this. My thoughts and prayers were with the families and those who lost their lives in that tragedy. The reason I made my first visit on this trip here to this small town south of Rensselaer, NY was to photograph Amtrak Empire Service Train #255 going around 110mph through here as a good friend of mine was the engineer on that train! You'll see the photo a little later on in the travelogue. After getting the photo, I drove back to Rensselaer and parked the car in the Amtrak Station's lot and met up with my engineer friend as his work day had just ended. I took a night photo of Train #49 with the Albany skyline in the background outside the station. I then took another photo of a combined train #49 and #449 from the bridge on nearby Broadway in Rensselaer. I then drove up to near a Holiday Inn Express hotel in East Greenbush to get a night photo of the Albany skyline from a nice high overhead location before having some good wings and a Buffalo Chicken sandwich at a sports bar next to that hotel. I eventually drove back to the hotel and picked up some bottled water and Diet Pepsi from the Sunoco station next door to the hotel and would start writing this travelogue and eventually call it a day. The plan for today was to head out to Amsterdam to go railfanning there (you'll see some photos from there later). After breakfast at Dunkin Donuts which is conveniently located next door to the hotel, I drove out to Amsterdam and would spend the next 2-3 hours there. There was one railfan from Saratoga Springs there shooting video when I arrived. The weather was quite nice for mid-December with bright sunny skies and temps just above freezing! You really can't ask for much more this time of the year! A friend of mine showed up while I was there and the 3 of us railfanned for awhile before I had to leave to actually get some shopping done (that was the reason for this trip right?). After finishing most of my shopping, I met up with a friend of mine at a place called the Northway Church in Clifton Park to attend services there, then had dinner with friends at an upscale restaurant in Albany called "74 State Street". The food was excellent and so was the service though they had a jazz band playing while we were there, and yes, they were very good but were also very loud! It was rather difficult to talk over them (not really their fault, it was a rather small restaurant). I drove back to the hotel after dinner and called it a day. I started today with another good breakfast at Dunkin Donuts! I had to get one more gift to complete my shopping so once that was done, I drove out to Cheviot which is a park in Germantown, NY about 39 miles south of the Albany-Rensselaer Station in between Hudson and Rhinecliff. This park overlooks the Hudson River and is a great spot to railfan on the now Amtrak Hudson Line! Amtrak recently signed a long-term lease to operate, maintain, and dispatch the Hudson Line from CP-75 near Poughkeepsie where Metro-North takes over, up to Hoffmanns at CP-169 where CSX freights join the mainline coming up from Selkirk. CSX had done this prior to Amtrak taking things over and still technically owns the line but Amtrak is in charge of just about everything happening with it. This is great for Amtrak knowing they will be dispatching their own trains on this route! After spending a few hours in Cheviot, railfanning with a friend in the area, I drove back to Amsterdam, NY and met up with the same friend there to have some chicken wings and gravy fries at Russo's Grille in Amsterdam which has a great view of the tracks from the front window of the place. In between several CSX freights that went by, I also saw the Lake Shore Limited, Maple Leaf, and an Empire Service train go by. After leaving Russo's, I drove back to Albany to my hotel and eventually called it a day. We departed Schenectady on time at 1:22pm. I was seated in Amfleet I Coach #82803 though I would only use the seat when I first boarded the train and I would stay there until just after departing our next stop of Amsterdam, NY where we departed at 1:41pm, 2 minutes late. I then headed into the cafe car and would spend the rest of the ride to Buffalo there as the Conductor on this train was a friend of mine whom I haven't rode with in 2 years so I would end up spending the rest of the trip in the cafe car with the crew. We had to stop once briefly at CP-184 due to a work area and we would see Train #48 - The Lake Shore Limited pass us then we would pass a couple freights before moving on. We also had to stop briefly at CP-225 but that was no big deal. We made our next stop at Utica, NY at 2:49pm where I was able to get a few quick photos before we departed at 2:52pm running 9 minutes late, no big deal there. We made our next stop at Rome, NY at 3:05pm and departed there at 3:06pm, 8 minutes late. The ride was relatively uneventful so far which is always a good thing. Our next stop would be Syracuse at 3:45pm where we picked up a new engineer for the rest of the way to Niagara Falls where this train terminates (though I would be getting off the train at Buffalo-Depew Station). We departed on time at 3:53pm. We continued along the route and at our next stop of Rochester, NY, we arrived there at 5:08pm, 9 minutes early! A smoking break was permitted since we arrived in Rochester so early. We departed there at 5:18pm, running 1 minute late. Once again, things were very much uneventful and I had a good time chatting with the train crew discussing a variety of topics about Amtrak in general. 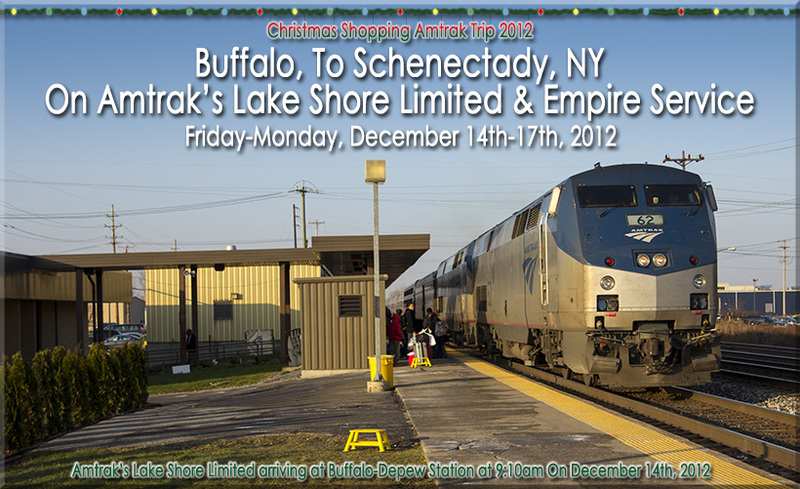 At 6:09pm, we arrived at Buffalo-Depew Station at 6:09pm some 15 minutes early!!! I got off the train, and headed home. This trip featured two top notch train rides on Amtrak with absolutely top notch, professional crews on both trains! I also got in some good railfanning (and completing my Christmas Shopping). This would be my 3rd and final Amtrak trip for 2012. 2012 also saw me make my 50th Amtrak trip since my first in 1996. I could never have imagined back then, when I was just 18 years old (am I getting old? ), that I would make 50 more trips in that time and ride a total of 153 Amtrak trains total! Included below are 4 sets of photos taken on this trip (you know I can't write a travelogue without including a zillion photos! ), just click any of the links below to see some great pix from this trip! Until my next trip which will be in the fall of next year, and whose destination I'm not quite ready to reveal just yet, other than to say I got something great in mind, Happy Railfanning!! !